Instantbird 1.5 has been released: go grab your copy now! There are a ton of new features and bugs fixed for this new release, but we’d like to highlight a couple of new features below. 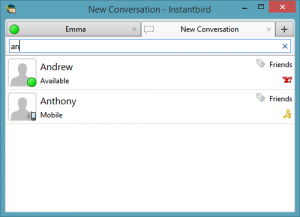 An exciting new feature you’ll find in Instantbird 1.5 is the New Conversation tab. It displays a list of your contacts, ordered based on how frequently and recently you’ve talked to them. Starting a conversation has never been easier! No longer will you have to open a separate window and scroll through your contact list to find a person. Just click the “+” button or press Ctrl/Cmd+T, start typing the name of the contact, and you should see your contact appear at the top of the list after typing only a few letters! You can then press enter and your conversation opens! The first time you open the tab, Instantbird will load your chat logs and learn who you talk to most often in order to offer accurate suggestions. New friends might not show up at the top immediately, but keep talking to them and they’ll reorder themselves. Don’t worry though, this ranking data is kept only on your own computer and is not transmitted or shared in any way! Additionally, if you use Instantbird for IRC, the New Conversation tab will automatically query your servers to download the list of channels that are available to you. (This is generally known as LIST in IRC jargon.) Just like with your contacts, you can type in the name of a channel and it’ll bubble to the top of the list. Sometimes you don’t always know the channel name (that’s why you’re searching, right? ): we’ve got you covered there too! Instantbird will search the channel topics in addition to channel names so you can quickly find new channels to join! A very visible user interface improvement that was included for Instantbird 1.5 is redone tooltips that fit more into the visual style of the rest of the user interface. They should be immediately familiar to Instantbird users as they’re modeled after the conversation header! Hopefully this will help you find information quickly and easily whether conversing with your contacts or just checking their status. 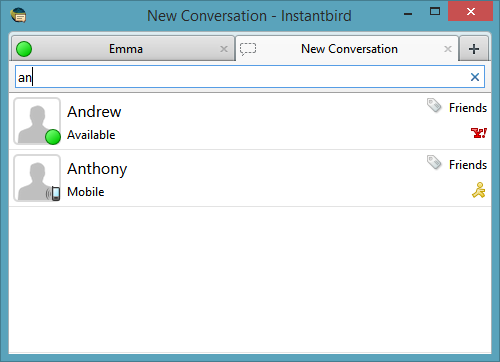 If you’d like to see a complete list of what’s new in Instantbird 1.5, please view the release notes.